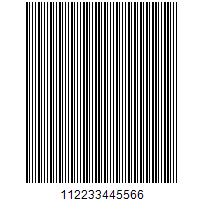 MSI Plessey is a numeric linear barcode symbology with a variable data length. .NET barcode writing & drawing component supports creating all MSI Plessey types, and provides flexible settings for C# developers to adjust various barcode properties to control barcode size, resolution, color, font, etc. All you need to do is to make sure that you have installed Microsoft Visual Studio 2005 or a later version, and then you can create a C# imaging project and copy C# sample codes to your application. asp.net excel viewer: ASP.NET Excel Viewer in C# Control (MVC & WebForms): view Office Excel document in web browser. You can easily generator MSI Plessey barcode and save it to image files/object using this C#.NET barcode generator control. The following steps will show how to create a MSI Plessey type barcode encoding numeric data text "112233445566" into the image object with XImage.Barcode.Creator. Please copy the sample code as follow to generator a MSI Plessey barcode. This C#.NET MSI Plessey Barcode Generator makes it extremely easy to generate & create MSI Plessey barcode on common image files including popular image formats png, gif, jpeg and bmp in C#.NET class applications, such as .NET WinForms, ASP.NET web applications, Visual C#.NET Class Library, and so on. Copy C#.NET code below to print an MSI Plessey bar code with numeric data "112233445566" encoded. You are able to set basic parameters, such as barcode width & height, margins on four sides, barcode color & orientation, and finally you can save it to your local disk. If you want to generate an MSI Plessey barcode at certain area of a document file, like Word, Excel, PowerPoint, PDF and TIFF, this C#.NET barcode creator control can fully meet your requirement. It allows you to select one page from a PDF, multi-page TIFF, Excel, PowerPoint or Microsoft Office Word document, and specify a certain area on that page to generate MSI Plessey barcode. Please refer to the examples below to get barcode generation demos for each file type respectively. The C# code below contains all the parameters that can be used to customize MSI Plessey barcode generation in C#.NET imaging project. Below is just an example of generating an MSI Plessey barcode on a png image file within a .NET class application.